Sometimes, I have good ideas. Sometimes, other people have ideas I wish I’d thought of. Case in point: Gizmodo.com is running a contest to create music, in 3 minutes or less, based on audio from defective Hitachi hard drives. 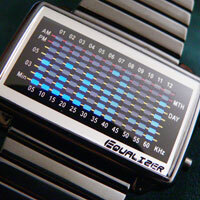 Win, and they’ll give you an insanely cool equalizer watch that could only have been designed in Japan. Now, come on. This has to be a CDM reader who wins this contest, right? That or else we have to come up with our own, better idea. Or, for that matter, better recordings than these Hitachi sounds — surely some of you have dying hard driv– Bad Disk Error. (A)bort, (R)etry, (F)ail? Is WhoSampled’s app set to be the Shazam of pro users?